The East Nashville Lady Eagles (20-4 overall, 11-1 metro and 9-1 district) has learned what is means to have a bulls-eye on their back. The Class AA defending champs have endured peaks and valleys in 2017. 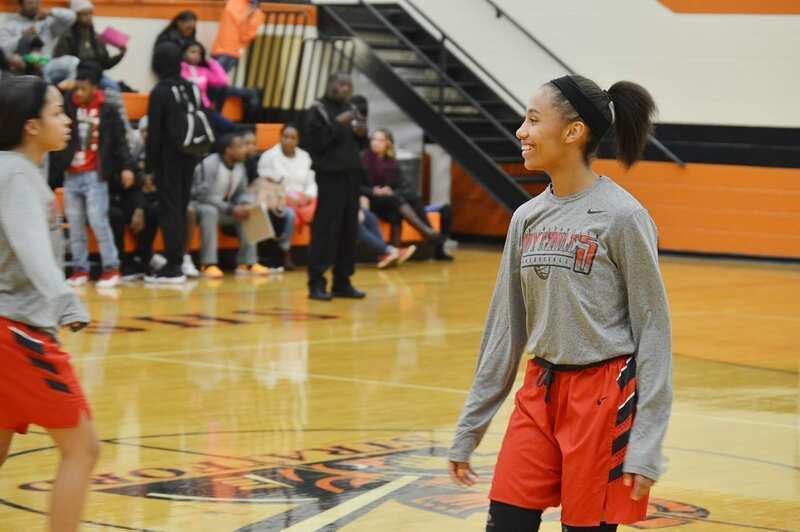 The year started promising then an injury to their all-state point guard junior Kaia Upton set them back. The loss forced freshman Ariel Richardson to grow up fast. A tough two holiday tournaments gave them a since of toughness going into the district. A January 20 home loss to Maplewood broke a 28 game metro winning streak. Win number 20 on the season was a tough one in last week’s 46-43 win over Lipscomb. Miss Basketball candidate Erica Haynes-Overton scored 25 points in the win but it was Richardson’s two free throws with 23 seconds left that gave East a three-point lead. Lipscomb couldn’t get a good look to tie the score. Tomorrow the target will be back when they take on the second ranked Pearl-Cohn Lady Firebirds (14-3, 7-1 and 8-1) on the road. The Lady Firebirds’ only metro and district loss was a 43-35 overtime loss to East. In the game, senior Janiah Sandifer received her second technical foul with her team up 11 points with a little over four minutes to go. Sandifer’s loss sparked the Lady Eagles to victory. Friday’s game could easily determine the top seed for the upcoming district tournament. In boys’ play, the Whites Creek Cobras (20-3, 10-1 and 10-0) find themselves back on top of the Wallace Media Group rankings. Like the East-Pearl-Cohn girls’, tomorrow’s game at third ranked (17-5, 10-1 and 8-1) could determine the top seed for the district. Last week the Cobras went 3-0 all on the road. Two blowout wins over number 12 Stratford (7-15, 4-10 and 2-7) and number 10 Pearl-Cohn (8-11, 4-5 and 3-5) sandwiched a grueling 53-45 victory over fifth ranked East (18-6, 9-4 and 7-3). The Eagles took a two-point lead on a Jayden Lockett bucket with 4:47 left. 6’10 senior Ruot Monyyong (20 points and 17 rebounds) scored 19 seconds later to tie the game at 44. A controversial moving screen foul call on Eagle sophomore Taras Carter was a game changer. On the Cobras’ next possession, junior guard Isaiah Bowers hit his lone three-point shot to give his team a lead that they didn’t relinquish.